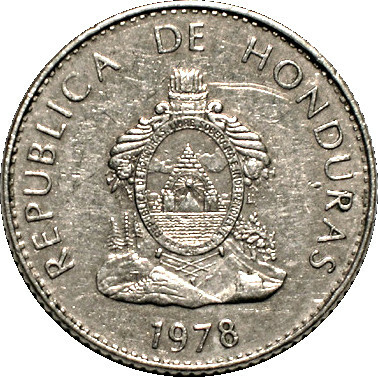 "Republica de Honduras" over the Honduran coat of arms: the triangle Coat of Arms of the Central American federation with a volcano between two towers in an oval. 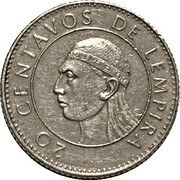 Behind it are a sun and a rainbow. 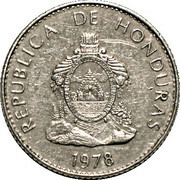 Around the oval are the words "Republica de Honduras Libre, Soberana, E Independiente" On the oval are two cornucopias and a quiver of arrows. Under the oval is a landscape with oak and pine trees, and mining equipment. 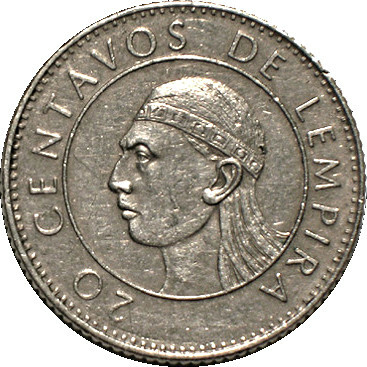 "20 Centavos de Lempira" over portrait of Lempira (without feathers) facing left within a circle, and denomination.